If you have fine hair, you probably already know the many difficulties it presents. Fine hair can start to look oily after only a day or two. It can also be difficult to style because of the lack of body. Below are some tips for giving your fine hair some body. Washing your hair regularly will help to reduce the oily look. Use a nourishing, light and sulfate-free shampoo. Shampoos rich in moisture don’t work so well with fine hair. Aveda’s Pure Abundance shampoo and the rest of the Pure Abundance line are good chooses. The Aveda Rosemary Mint shampoo and conditioner work well too. Leave-in conditioners don’t work as well on fine hair because they tend to be heavy. 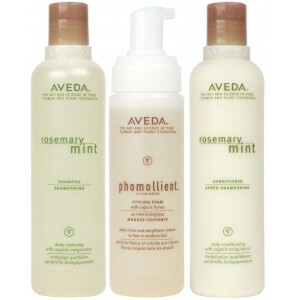 Volume foam or styling whip like Aveda’s Phomellient Styling Foam will serve you better. Try to avoid styling your hair with heat styling. If it’s necessary use the lowest setting possible and use a thermal protector. The right hair cut will help your hair have more body. If you want a style with body, talk to your XEX stylist about the best option for your hair type and face shape. Fine hair can be brittle. If you have the time, let your hair air dry to avoid the damage done by the blowdryer. This is great stuff, and I don’t even have fine hair. My wife and your blog say that Aveda’s Phomellient Styling Foam is the best! Aveda’s Phomellient Styling Foam. 10 years and still counting that I have used it.